Last week we looked at Asa part 1. What was significant about Asa? Today we are going to cover what was happening in the first 28 yrs of Asa reign. I have entitled today’s lesson. From bad to worse. 25 Nadab son of Jeroboam became king of Israel in the second year of Asa king of Judah, and he reigned over Israel two years. 26 He did evil in the eyes of the Lord, following the ways of his father and committing the same sin his father had caused Israel to commit. 27 Baasha son of Ahijah from the tribe of Issachar plotted against him, and he struck him down at Gibbethon, a Philistine town, while Nadab and all Israel were besieging it. 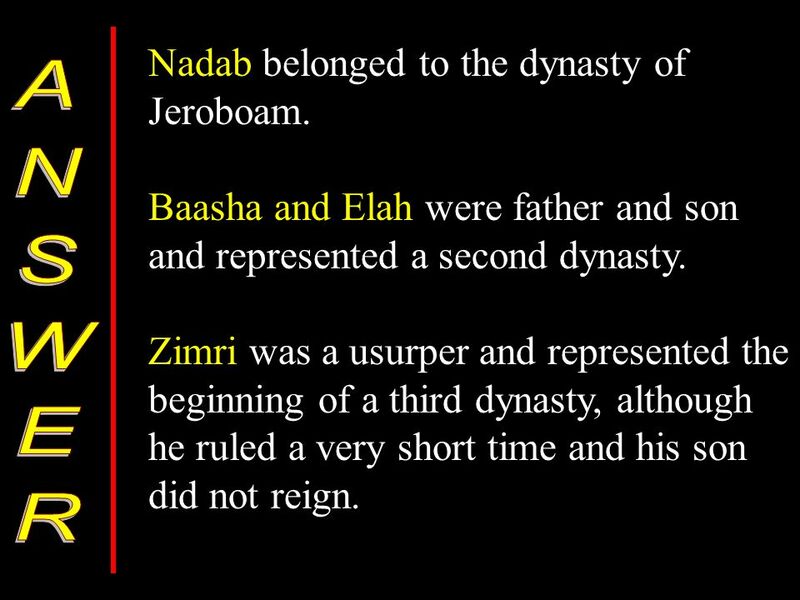 28 Baasha killed Nadab in the third year of Asa king of Judah and succeeded him as king. 29 As soon as he began to reign, he killed Jeroboam’s whole family. He did not leave Jeroboam anyone that breathed, but destroyed them all, according to the word of the Lord given through his servant Ahijah the Shilonite. 30 This happened because of the sins Jeroboam had committed and had caused Israel to commit, and because he aroused the anger of the Lord, the God of Israel. 31 As for the other events of Nadab’s reign, and all he did, are they not written in the book of the annals of the kings of Israel? 32 There was war between Asa and Baasha king of Israel throughout their reigns. 33 In the third year of Asa king of Judah, Baasha son of Ahijah became king of all Israel in Tirzah, and he reigned twenty-four years. 34 He did evil in the eyes of the Lord, following the ways of Jeroboam and committing the same sin Jeroboam had caused Israel to commit. 5 As for the other events of Baasha’s reign, what he did and his achievements, are they not written in the book of the annals of the kings of Israel? 6 Baasha rested with his ancestors and was buried in Tirzah. And Elah his son succeeded him as king. 7 Moreover, the word of the Lord came through the prophet Jehu son of Hanani to Baasha and his house, because of all the evil he had done in the eyes of the Lord, arousing his anger by the things he did, becoming like the house of Jeroboam—and also because he destroyed it. 8 In the twenty-sixth year of Asa king of Judah, Elah son of Baasha became king of Israel, and he reigned in Tirzah two years. 9 Zimri, one of his officials, who had command of half his chariots, plotted against him. Elah was in Tirzah at the time, getting drunk in the home of Arza, the palace administrator at Tirzah. 10 Zimri came in, struck him down and killed him in the twenty-seventh year of Asa king of Judah. Then he succeeded him as king. 11 As soon as he began to reign and was seated on the throne, he killed off Baasha’s whole family. He did not spare a single male, whether relative or friend. 12 So Zimri destroyed the whole family of Baasha, in accordance with the word of the Lord spoken against Baasha through the prophet Jehu— 13 because of all the sins Baasha and his son Elah had committed and had caused Israel to commit, so that they aroused the anger of the Lord, the God of Israel, by their worthless idols. 14 As for the other events of Elah’s reign, and all he did, are they not written in the book of the annals of the kings of Israel? 15 In the twenty-seventh year of Asa king of Judah, Zimri reigned in Tirzah seven days. The army was encamped near Gibbethon, a Philistine town. 16 When the Israelites in the camp heard that Zimri had plotted against the king and murdered him, they proclaimed Omri, the commander of the army, king over Israel that very day there in the camp. 17 Then Omri and all the Israelites with him withdrew from Gibbethon and laid siege to Tirzah. 18 When Zimri saw that the city was taken, he went into the citadel of the royal palace and set the palace on fire around him. So he died, 19 because of the sins he had committed, doing evil in the eyes of the Lord and following the ways of Jeroboam and committing the same sin Jeroboam had caused Israel to commit. 20 As for the other events of Zimri’s reign, and the rebellion he carried out, are they not written in the book of the annals of the kings of Israel? So today we will be covering the lives of several kings of Israel and hopefully we can glean a couple of lessons from their stories and move ahead in the timeline a bit faster. It has been said a picture is worth a thousand words so hopefully this picture will help us understand where we are. That being said He deals with us individually and disciplines us for our own sins, and that is His right He is Sovereign, and He knows what is best for each of us and how to reach each of us. 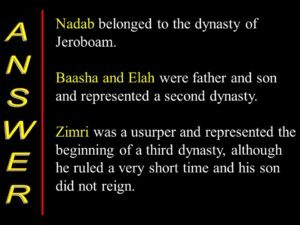 25 Nadab son of Jeroboam became king of Israel in the second year of Asa king of Judah, and he reigned over Israel two years. 26 He did evil in the eyes of the Lord, following the ways of his father and committing the same sin his father had caused Israel to commit. 27 Baasha son of Ahijah from the tribe of Issachar plotted against him, and he struck him down at Gibbethon, a Philistine town, while Nadab and all Israel were besieging it. He was the son of Jeroboam. He reigns for 2 yrs, and 1 of his own commander rebels against Him. Does any of this sound familiar? It sound a lot like to what His father did to Solomon. Some people use the term Karma, Let me say up front Karma is from Hinduism and Buddhism. Action, seen as bringing upon oneself inevitable results, good or bad, either in this life or in a reincarnation. the cosmic principle according to which each person is rewarded or punished in one incarnation according to that person’s deeds in the previous incarnation. There is something is scripture that is similar called the principle of sowing and reaping, that God uses but the idea of Karma is a lie from Satan to make us think we can deal with our sin on our own. We do not believe in that concept. Why? Because we believe in something so much greater.. GRACE. Grace says we do not not receive what we deserve but instead we receive Grace and Mercy. Now I know we have covered this before but I think it is important to cover it again for those who have not learned it or those who have forgotten it. What is the difference between Grace and Mercy? Mercy is not receiving what we deserve, Grace is receiving what we do not deserve. Our lives contain moments of Grace but the right response is to be transformed by them. To accept His Grace through the finished work of Jesus on the cross for us. Nadab only sees a man who starts with God and walks away. He saw his father only after he walked away form God. As a result he receives a knowledge of God but not a walk with God. This is so important, Parents and grandparents, as you have influence with those below you teach them what a life of walking with God looks like. Be intentional. Don’t just show them, tell them! Talk about how God is continually working on you. Don’t pretend that you have arrived and are perfect. Instead tell them how God convicts and show them how to respond to that conviction with repentance. I believe repentance is something that needs to be taught as much as it is caught. One of the most devastating thing in today’s church is how many people, who have a knowledge of God but not a walk with God. What we have seen is Grandparents who walked fervently, parents who walked occasionally, now a generation who is walking away. Compromised Christianity is the greatest threat to the church today. Not the world. The greatest problem is us! 28 Baasha killed Nadab in the third year of Asa king of Judah and succeeded him as king. Here we see God’s prophecy fulfilled to Jeroboam that God would wipe out all of His family because of the detestable sins that he led God’s people to commit. but do not think that God was not patient. He gave Jeroboam 22 yrs to repent. Small summary for 24 yrs. why? Your importance to the story of God is directly proportional to your yielding to God. For most people their place in History will be merely a footnote. Because History is HIS story, and we are not telling it. The most important people in God’s history are the yielded ones. God is patient – 24 yrs He did evil in the sight of the Lord. Think about those he rules for 24 yrs to be under a bad king. God does not look at time the same way we do. We must understand God is not in a hurry to deal with stuff the way we are. What 3 things does God give Him? The conviction of God is sweet – continue to pray God convict me. Ego will drive you away from God and godly friends but humility will drive you to God and godly friends. Grace time – time between revelation and Judgement is Grace. Lack of Peace – Signal to change something. These 3 go together. With a lack of peace and no revelation yo might think it is just you or circumstances. But God is gracious and he sends His word to correct and guide. 16 All Scripture is God-breathed and is useful for teaching, rebuking, correcting and training in righteousness, 17 so that the servant of Godmay be thoroughly equipped for every good work. God sends trouble to get us to seek Him to ask Him what we need to work on. He will answer that prayer if we seek Him. God does not want you to have trouble and not explain it Now he may not explain it right away but I believe He will always show us what it about if we seek Him. 19 yrs in to Baasha’s reign there is a significant event it is found in 2 Chronicles 16. It is the second half of Asa’s story that we will deal with next week. Next we see the reign of Elah. 9 Zimri, one of his officials, who had command of half his chariots, plotted against him. Elah was in Tirzah at the time, getting drunk in the home of Arza, the palace administrator at Tirzah. Drunkered… Why? drinking is the symptom – not the problem. It is a form of escape, A desire for relief and pleasure over responsibility. Lets think about His life for a second. He is a prince who becomes a king, your father kills off the entire line before you, fulfilling a prophecy that God made to that end. But now, Your father has been given the same prophecy over his household. How would you respond? It might just drive you to drink. But don’t miss this. God is merciful and gracious, Elah could have repented and turned to God, but instead he had 2 major issues in his life. He had a great disregard for the Word of the Lord and for history. It amazes me that people think they can do the same things they have always done or things that they see in others and somehow they will escape the consequences of those paths. Definition of insanity by Albert Einstine. To do the same thing over and over and expect a different result. Warning: If you come from a difficult situation, (alcoholism, drugs, divorce) in your family of origin, do not play around with those things and expect a different result. 10 Zimri came in, struck him down and killed him in the twenty-seventh year of Asa king of Judah. Then he succeeded him as king. Notice that something is added to his list of failures. Idols are added. Up until now we knew they were worshiping God with the golden calfs but now they have begun to add idols to the worship. 15 In the twenty-seventh year of Asa king of Judah, Zimri reigned in Tirzah seven days. The army was encamped near Gibbethon, a Philistine town. 16 When the Israelites in the camp heard that Zimri had plotted against the king and murdered him, they proclaimed Omri, the commander of the army, king over Israel that very day there in the camp. Although he reigned only 7 days he spent most of those days murdering people. I don’t know if you noticed it but in verse 11 something significant happens. Killed all family AND FRIENDS. We are going form bad to worse. Then we see something that happens only 4 times in the Old Testement. 17 Then Omri and all the Israelites with him withdrew from Gibbethon and laid siege to Tirzah. 18 When Zimri saw that the city was taken, he went into the citadel of the royal palace and set the palace on fire around him. So he died, 19 because of the sins he had committed, doing evil in the eyes of the Lord and following the ways of Jeroboam and committing the same sin Jeroboam had caused Israel to commit. Literally he went down in flames. Some people think that this may be where the idea of that phrase comes from. Omri’s story we will pick back up in a couple of weeks. He begins what might be considered the first dynasty of Israel. Next week will jump back and finish Asa’s story and see how this all intertwines. 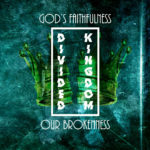 1 The only measure of ones life that matters is how surrendered to God we are. 3 God’s grace and mercy are always available to us if we will just humble ourselves and respond to His word.